Litko will be helping out Dropzone Commander players with a new set of tokens and templates specifically designed for use with the popular minis game. 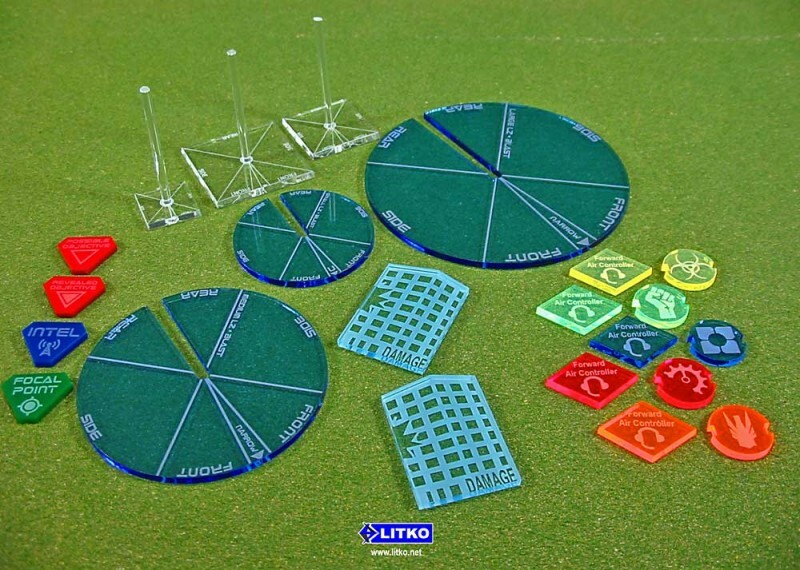 Litko will be helping Dropozone Commander players upgrade their game soon with a new line of gaming accessories compatible with the popular miniature wargame. The line will include Tactical flight bases which have the firing arcs laser etched into them, Blast/LZ Templates, Goal Oriented scenario tokens, Building Damage markers, and Faction specific activation tokens. Working directly from gamer feedback, Litko has made each blast template to incorporate all firing arcs and center cuts to fit around the flight stand pole for perfect centering on flying models. The Goal oriented tokens will include the proportionate number of double-sided Possible and Revealed Objective tokens for both Objective scenario types. Over-sized and reverse etched for high visibility, the Building Markers won't ever be overlooked across war-torn skylines. Each faction specific token set strikingly features a unique icon and color for activation tokens along with Forward Air Controller tokens for your forces. Litko has released a production photo of the entire line. Pricing to follow.